In this series we have covered the solution your business plan puts forward to solve the customers problem. This idea must now be tested to see whether there are any customers for it and to see how large the available market might be. To the investor, the solution in itself has no value unless it can be realized in the market place. Ultimately, it will be the industry market size that decides the value of your business to an investor and, as a rule of thumb, the bigger the available market, the better. Before calculating market size we need to look at a couple of definitions. For a business plan, the available market is defined by two terms, total available market (TAM) and served available market (SAM). TAM (Total Available Market) is the total market size (people, revenues, units etc.) who have the problem you are seeking to solve today. 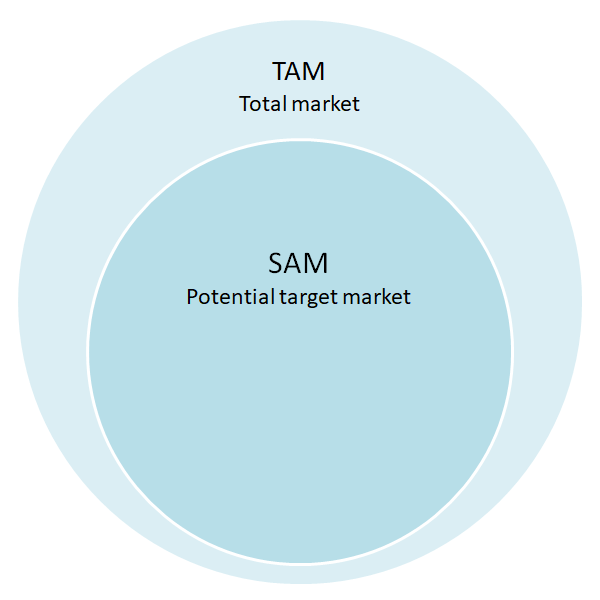 SAM (Served Available Market) is the part of the TAM who are able to use your solution to the problem. This is your target market. As an example of how to determine market size (using made up data), suppose you are in the lawn care business. You have just started and have one operation but have plans to expand throughout the region into a chain of lawn care centers. This means that if your business operated throughout the entire region with no competition its revenues would be 27 million per year. TAM defines the maximum size for the market the business operates in. If there was no competition within the town and you had the resources to provide the service, then the revenue from the business would be 4.5 million per year. The SAM represents 16.7% of the TAM. The business plan market size section can be presented in a number of formats, but a simple column format setting out the TAM and SAM now and in five years time, will allow the investor to quickly ascertain how big the market for the product could be and it prospects for growth over the duration of the business plan. Market sizing is an important part of the business plan process. But this is planning not accounting. The market size section is an educated guess at how big the available market for the product is and aims to show that a successful launch and continued growth for the product is possible. It is based on available statistics and trade association data. Start from verifiable and accurate base data. In the above example, the starting point was a government statistic based on the number of properties with gardens. Double check any information with an alternative source if possible. Check the results make sense. Check the results using a bottom up calculation. For example, if you know a lawn care business in the region has revenue of 500,000 and estimated 2% of the market, then the TAM should be in the order of 500,000 / 2% = 25 million compared to the 27 million calculated above. Keep the industry definition narrow, in this case lawn care treatments. Be specific, don’t try and say for example, there are millions of properties in the world with gardens and if we can take a very small percentage of that our plan will work. The analysis will differ depending on whether you are dealing with an existing market or a completely new market. For an existing product there will be market and industry data available, for a new product you may need to carry out market size research with potential customers and work upwards from there. This is part of the financial projections and Contents of a Business Plan Guide, a series of posts on what each section of a simple business plan should include. The next post in this series is about the analysis of the target market for the business plan product.